Hi guys! 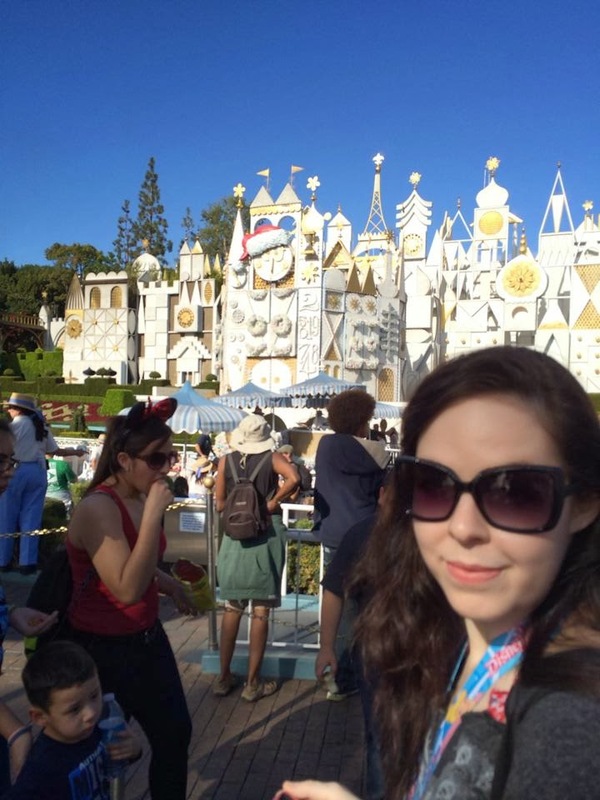 Time for another glorious trip report, highlighting our time in the Disneyland Resort. For the sake of flow, this report will be written by Jenn with Moon popping in for notes - don't worry, these will be clearly delineated. As with my last trip report, a lot of food reviews will be held for a later post, so stay tuned for that. Hope you enjoy! To read all the posts in this report, click here. When we left off last time, Moon and I had just completed the Tinker Bell Half Marathon because we are awesome. We were FREEZING post-race, so we wrapped ourselves in reflective blankets and hightailed it straight from the finish to our hotel. Once there, we ate a few items out of our runDisney snack boxes and took turns in the shower. I really should've hurried us along with the intention of making my original goal of rope drop... but the shower felt so nice and warm and it was lovely to relax and check some email and such... so yeah. As the designated park commando, I failed. But we made it into Disneyland around 9:30AM, so really - not too shabby. The first thing we did upon entry was pick up a map. This just felt wrong. I mean, we're in a Disney park. 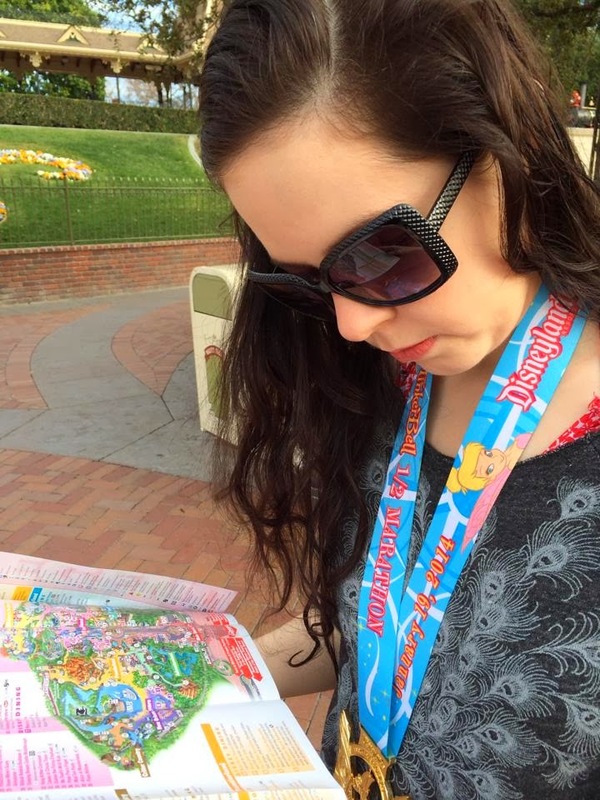 I NEVER need a map in Walt Disney World! To compound the weirdness, a lot of Disneyland feels remarkably like the Magic Kingdom, so much so that the deja vu is strong enough to indicate a glitch in the Matrix. But then you'll turn a corner and WAIT A MINUTE WHAT HAPPENED TO THE HAUNTED MANSION? Oh, it's over there? What on earth is it doing over there? That's not where it goes! Er... if you know what I mean. MOON: …SIGH! (Is this where I get to kiiiinda gloat that I’m not too bad at navigation? A natural born cartographer). This looks wrong. Don't you think it looks wrong? And what did we choose as our very first Disneyland attraction ever? Indiana Jones and the Temple of Doom! I chose to prioritize rides that were unique to or significantly different in WDW, and Indiana Jones seemed like a great place to start as we're both big fans of Dinosaur in Disney's Animal Kingdom. It was fun, but... um... would you be very angry if I mentioned that we both liked Dinosaur better? MOON: There was a small hill and I was displeased. I also prefer dinosaurs. Especially vegetarian ones! From there we proceeded directly to the Matterhorn, but the line was long and for some reason there was no FastPass; we moved deeper into Fantasyland, where I proceeded to get inordinately excited over MR. TOAD'S WILD RIDE YES. There was practically no wait, so we hopped in line. As we inched toward the entrance of Toad Hall, we happened to spot some characters next to the carousel. It was... Doctor Who? Multiple Doctors Who, in fact, including a subpar Matt Smith, and impressive River Song, and a seriously authentic-looking Tom Baker. Over the course of the day we saw many more Doctors strolling around the park, including more Matt Smiths, some David Tennants, a lesser Tom Baker, and at least one Christoper Eccleston, plus a bunch of people wearing Who attire. I don't know if there was a convention in town or an unofficial Disney Who Day or what, but this group was committed. MOON: The Whos were a fixture throughout the entirety of our trip. Not really sure if we missed the convention? I only know he's supposed to be Matt Smith because Stetsons are cool. Now that's a Tom Baker. After Mr. Toad killed us and sent us to Hell, we rode Pinocchio with no wait, which dumped us out by the Frozen meet and greet with Anna and Elsa. The line was waaaaay too long to consider, but there was a nifty audio-animatronic Olaf snowman hanging out on the roof trying to talk people into trading off their appendages. "Hey, nice shoes. Can I borrow them? Oh, I don't have any feet. Hey, nice feet. Can I borrow them?" My undergraduate thesis was about the relationship between Lewis Carroll and his Alice illustrator John Tenniel, so naturally I freaked out over the Alice in Wonderland ride and its AMAZING caterpillar cars. I want one in my house. The ride itself was a little odd though, no? I mean, it seems to end, your car wanders around outside for a bit, then suddenly a random Mad Tea Party addition, then it's over. Hmmm. But still. CATERPILLARS. Oh, and the Cheshire Cat! I <3 Sterling Holloway. I think we can all agree that this is the greatest photo ever. Next we rode the Storybook Land Canal Boats, skipping the line because there were only two of us, and we floated through many a miniature village. Pretty adorable, I must say. I dragged Moon over to Space Mountain and bullied her into getting Space Mountain FastPasses. To make up for this heartlessness, we stopped in at the Jolly Holiday Bakery for a leisurely lunch of Cokes and Jolly Holiday combos: grilled cheese and tomato soup. Review forthcoming! ...so we hopped into the Haunted Mansion queue instead. This version of the ride was not, to me, appreciably different, although it was interesting to walk through some portions of the Mansion that you ride past in WDW. Also, am I inventing things, or is the Ghost Host's speech in the elevator room a bit curtailed here? ...so we headed past it and over the it's a small world, just catching the 1:30PM parade of audio-animatronic figures that come out of the clock. Cute. The ride was still all done up for Christmas, so that was nice to see. Moon took some pictures of me in front of the small world facade, and then said this: "I'm going to make a tumblr called Jenn In Front of Disney Things." Should totally happen, no? 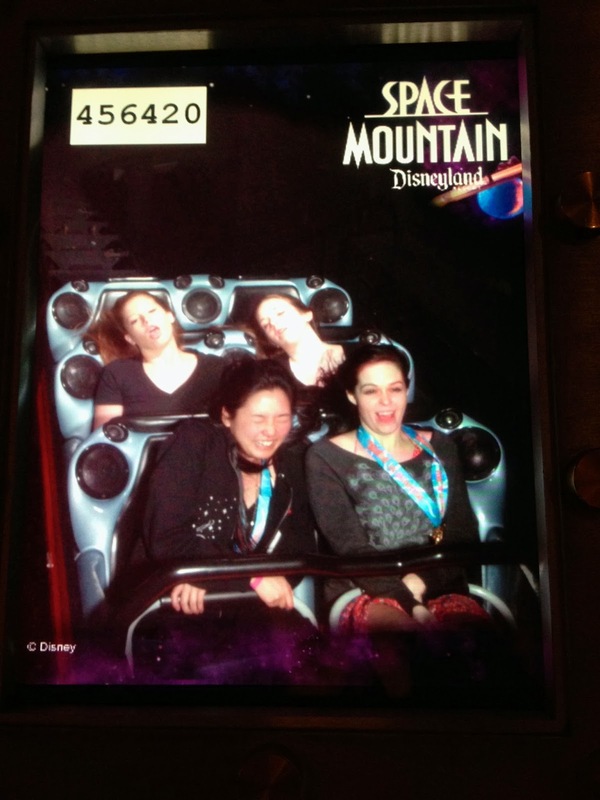 Much to Moon's chagrin, it was time to cash in on our Space Mountain FastPasses. Differences I noted: it seemed darked than MK's version, and of course the seating is better (those rockets at Space Mountain MK are unavoidably awkward), and my personal favorite: MUSIC! But I feel like the MK version is a little more intense. Moon thought... she thought... well, she can put what she thought here. I don't think it will be pretty. Space Mountain: it's killed before. As a huge fan of The Hall of Presidents, Moon was jazzed for Great Moments with Mr. Lincoln, so we meandered on down Main Street. MOON: I’m not sure this is an appropriate adjective given my apathy toward jazz. Or yours, for that matter. I stopped in at the candy store to pick up an item the Disney Food Blog has been teasing me with for years: the peanut butter sandwich. Hang tight for a review on that one. Pluto was holding court outside of the Lincoln entrance and Moon LOVES Pluto, so we hopped in line and took a photo with him (complete with hugs and kisses) before entering the Lincoln lobby. 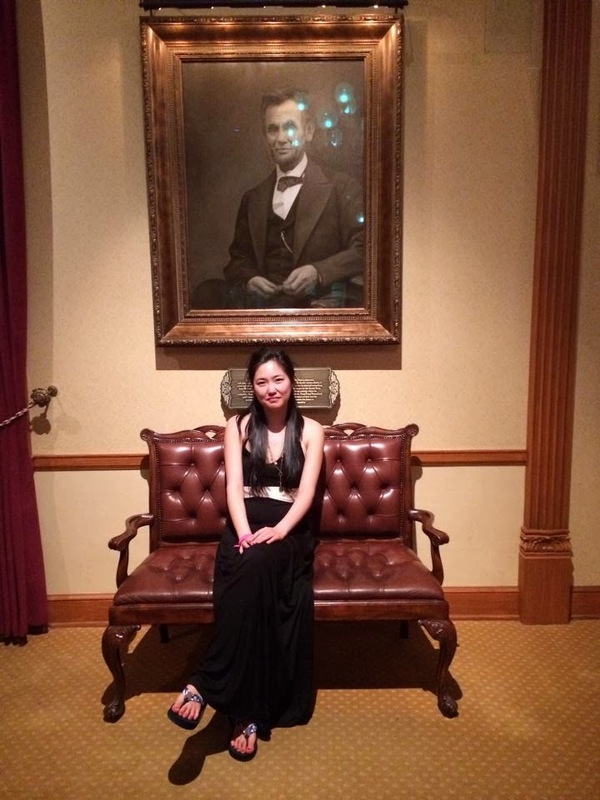 We took some pictures and explored the lobby exhibits before entering the theater for the show. It was no Hall of Presidents/American Adventure, but it was certainly neat seeing the same show presented all those years ago at the World's Fair. Historical! Fun facts: the Civil War sequence from the film here is pretty much exactly the same as the sequence from American Adventure; "Golden Dream" from AA plays as you leave the theater (ON FREEDOM'S WINNNNNND 'CROSS THE SKYYY-Y-Y-Y-Y). MOON: This is very unpatriotic of me, but I nearly lost my hat when the eagle appears in the backdrop when all the pomp and circumstance is going on. Does this happen in WDW, too? After a grand circle tour around the park courtesy of the Disneyland Railroad, a quick game of rock-paper-scissors determined that we would have dinner in Downtown Disney, so we left the park, took a sharp right turn, and there it was. Good ol' compact Disneyland Resort. First stop: World of Disney to scope out souvenirs. As always, I saw lots of things I wanted which I then talked myself out of buying, but Moon did pick up some cookies for her mom. MOON: I don’t think she liked them, but oh well. They were cute. We decided to head to the coffee shop in the Disneyland Hotel for something warm to drink; on the way, a DVC kiosk guy congratulated us on our race (of course we wore our medals) and then teased us gently for walking slow. Then he teased us for coming back the same way two minutes later, because the coffee shop was closed. Oh well. After some consideration, we found ourselves in Uva Bar for tea and food - review forthcoming. It was getting a little chilly - comparatively speaking, anyway - so we walked back to our hotel to hang out for a bit and change. After a brief break we threw on pants and hoodies and walked back to Disneyland for the fireworks. We briefly stood in line at the Starbucks for more hot drinks, but the line was approximately a thousand years long so we decided to scrap it. Instead we made our way to the hub and staked out spots next to a family that had marked their own territory with blankets, on the principle that they would at least keep the area in front of us relatively clear. This worked... technically. Unfortunately, when the fireworks started, they all floated DIRECTLY BEHIND A TREE. Julie Andrews was the narrator for the fireworks soundtrack and I LOOOOOOOOOOVE her, but not even she could save me from the frustration of the tree and the fact that all the songs were from Wishes, so we left and got in line for Pirates of the Caribbean instead. Now. The accepted rule is that whichever park you grow up with - Disneyland or Walt Disney World - that's the one you'll claim is the best. I'll offer more opinions on this at a later date as will Moon, but let me say with absolute confidence that what you've heard is true: Disneyland's PotC is far, far superior. It's longer, it's got more drops, and the story line is clearer. I simply cannot fathom why WDW chose to make a truncated version when the original is so awesome. 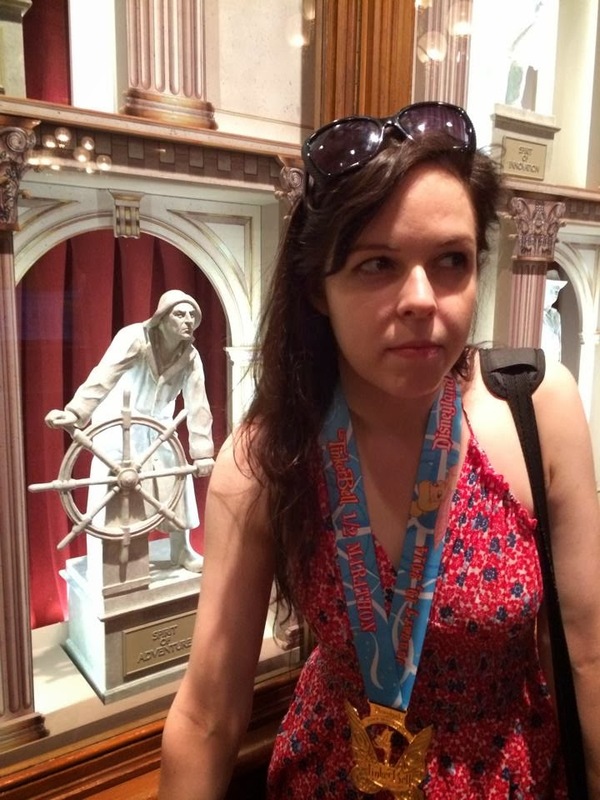 MOON: I will agree with Jenn that Disneyland’s PotC was more entertaining, but I still find that ride BOOOOOOOORING. Post PotC we went back to the hotel again and pretty much just crashed. Day one in Disneyland down - two more days to go! I feel like this makes it seem like I completely missed the point of the post, but your thesis sounds fascinating! What was your major (if you don't mind my asking)? I'm dying to ride Pirates at Disneyland (and, y'know, just *go* to Disneyland), just to see what the hubbub is about! I already love it in WDW, so I have a feeling that California's might blow my mind a little bit. Haha, my major was humanities - which is another way of saying I majored in whatever I felt like taking at the time. Music history and some art history and some writing courses; stuff like that. PotC was AWESOME. I loved it! You must ride it in August! We didn't eat at the Blue Bayou, sadly, but it was fun to drift past it, Gran Fiesta Tour-style. Moon is right, I find it positively hysterical when they have Disney World commercials and try to make Pirates looking really exciting and it's basically just a kid point enthusiastically... And now I think I need to go to Disneyland. THANKS FOR NOTHING JENN. No, wait, I mean - HOLD STRONG FOR MORE YACHT CLUB MONEY. Beaches and Cream! Beaches and Cream! I SO can not wait to go here! Thanks!